Marijuana and Mangoes - Do Mangoes Increase the Cannabis High? 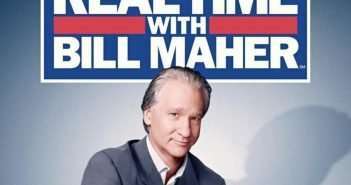 You are at:Home»Mary Jane»Learning»Marijuana and Mangoes – Do Mangoes Increase the Cannabis High? Marijuana and Mangoes – Do Mangoes Increase the Cannabis High? I have been hearing rumors and reading reports for several years now about how eating mangoes before smoking or vaping marijuana will help lengthen and intensify the high. But are the rumors true? Does eating mangoes really make you feel more high? I knew that the two plants share a terpene (the chemical element that gives plants flavor and aroma) called myrcene. Widely used in both the perfume and brewing industries, myrcene is an aromatic hydrocarbon that can be found, in varying degrees, in the essential oils of a large number of plants including black pepper, hops, bay leaves, basil, lemongrass, mangoes, and of course, marijuana. Myrcene has many therapeutic benefits including antibacterial, analgesic, and sedative effects. Myrcene, like marijuana, also shows promise in treating diabetes. So the myrcene present in both mangoes and marijuana made them a good flavor match when developing medicated recipes for sure, but was there really anything to the claims of mango’s magical power over the cannabis high? To find out I talked to Dr. Jeffrey Raber, CEO of The Werc Shop testing lab (www.thewercshop.com). According to Dr. Raber, there actually is something to the claims, although he stresses that a lot of the information about mangoes and marijuana is speculative at best, as it hasn’t been extensively tested. One of the things Raber says that makes this subject so complex and difficult to generalize is the fact that each plant variety, both mango and cannabis, contains different terpene profiles, and those other terpenes could in theory either enhance or mitigate the effects of other terpenes. Myrcene is thought to enhance the intensity and length of marijuana’s high because the terpene helps THC cross the blood-brain barrier faster and aid in the body’s absorption of cannabinoids. On a personal level, I have a monster tolerance to marijuana and most everything else, so I knew I was not the best test subject for the subtleties of a mango enhanced high. But I know a lot of stoners, so I started polling friends and acquaintances. Their reactions to the Mango/Marijuana connection ranged from bored indifference to enthusiastic approval. About the same range of reactions I get when I poll people outside of the cannabis community about whether or not they enjoy marijuana. Dr. Raber pointed out a good reason for this. There are thousands of varieties of mangoes, each with varying levels of myrcene, just as there are thousands of varieties of cannabis, each with varying degrees of myrcene and THC content. Achieving the right combination is a lot like achieving the perfect cannabis dose in cooking, it’s a matter of what works best for the individual’s metabolism along with the quality of the plants. Those who feel the effects, swear by them. One friend claims he can get by with less weed in lean financial times by supplementing his stash with mangoes. Others friends think it’s mostly psychological. Be sure to leave a comment and let me know what your experiments yield! If you want to try the theory out yourself, Dr. Raber says consuming mangoes 45 to 90 minutes before consuming cannabis will give your body enough time to absorb the fruit’s myrcene, which can then synergize with the marijuana’s cannabinoids and other terpenes. Since myrcene burns off at temperatures in excess of 147 degrees F, you will want to be sure to eat raw mangoes. Also since you would absorb different terpenes at different levels depending on whether you smoked or vaped the cannabis, Dr. Raber says this could also influence how much of the marijuana and mangoes effects you feel, or don’t feel. Oh darn, you’ll just have to experiment more. The more fragrant the better! The perfume industry uses myrcene for a reason, so if you have a particularly aromatic strain of mango or marijuana, chances are better it will have high myrcene levels. Myrcene aromas can include elements of peaches, grapes, vanilla, wine, pepper, and herbaceous greens. Generally speaking, higher quality cannabis has higher myrcene levels. One of myrcene’s therapeutic benefits is its sedative effect. Likewise, indica strains of marijuana, especially those known for inducing couch lock, are most likely to be high in myrcene. The riper the mango the better. According to The Big Book of Buds (2001 Quick American Archives) high myrcene mango strains include Cavalo, Rosa, Espada, Paulista. 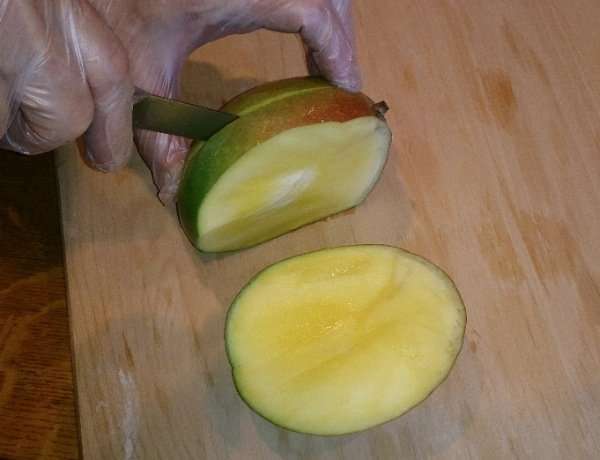 Color offers no clues as to a mango’s ripeness, instead gently squeeze the fruit and look for one that gives slightly much like a ripe peach or avocado. Sniff the stem end, if it has a fruity aroma, you’ll know you have a ripe, juicy mango. Mangoes will continue to ripen after picking, becoming softer and sweeter. For best results, store whole unripe or just ripe mangoes at room temperature, not in the refrigerator. Speed up ripening by storing whole mangoes in a closed paper bag. To extend the shelf life of whole ripe mangoes, you can store in the refrigerator. Once peeled and cut, store mangoes in the refrigerator for up to 5 days, or in the freezer for up to 6 months. Mangoes have a thick skin you will need to remove and they contain a single large flat oblong pit you will need to cut around. Always wash mangoes before peeling and cutting. Take a look at your mango. Regardless of which variety you use, you will notice the fruit is oblong and one side will have what looks like a small round indentation or “eye” and/or a subtle ridge that run along it. The oblong pit runs just behind this. 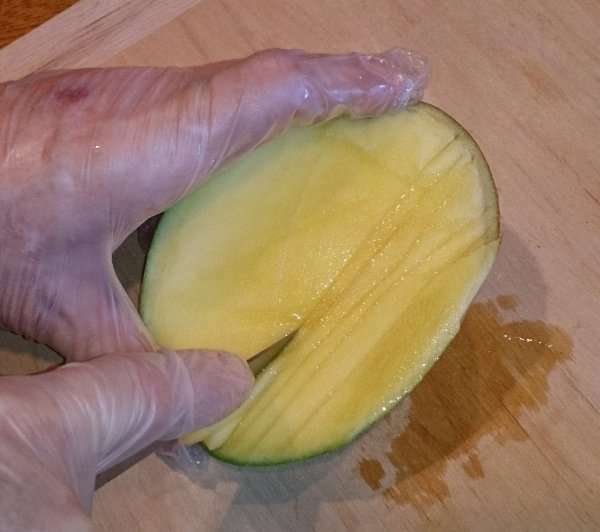 Put your mango on the cutting board and cut through the fruit about 1/4-inch off center from this point. Repeat, cutting about 1/4-inch from the other side of the center pit. This will leave you with two mango “cheeks.” Score the fruit into strips or cubes, taking care to not cut all the way through the skin. Now take a spoon and simply scoop out the mango slices or cubes. The center portion can also be peeled and you will be able to get a small amount of usable fruit from this piece by carving around the pit. 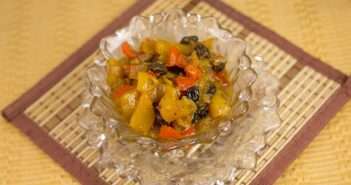 OK, so these recipes do not follow the protocol of eating the mango before you medicate, but as I stated earlier, because of the shared terpene myrcene, marijuana and mangoes make a terrific flavor match. 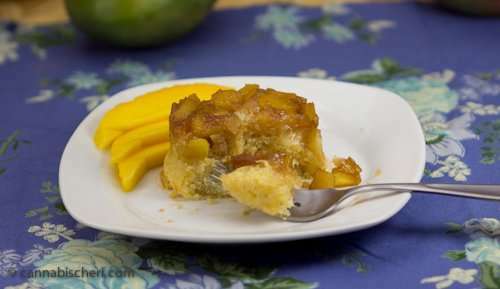 Likewise, it only makes sense to make medicated mango recipes! Here are some of my favorites.